Band photography always has many challenges in normal settings, when you put a band playing under cloudless skies midday one needs to find creative measures to overcome the lighting challenges. Luckily this day, the sun was bouncing around the light colored concrete walls and sidewalks. The band was under a large white tent which created a nice giant softbox. The big challenge was finding creative ways to get shots that included the crowd and the whole scene when the sun was bounding down upon everything. One way to overcome the lighting challenge in band photography on bright days, is to try to isolate the subject against the bright areas burnt out by the sun. Take shots of the crowd with the band silhouetting against the crowd. Isolate the subjects against bright buildings behind them. Get creative with challenging lighting situations. Another way to overcome the lighting challenge, is to use the bright light creatively to create a mood. Use all the light and make a high-key lo-fi look. If you are shooting in raw, you can pump up the contrast and shadows in Lightroom 4.Just remember that you need to harness the light and not let it ruin your day. 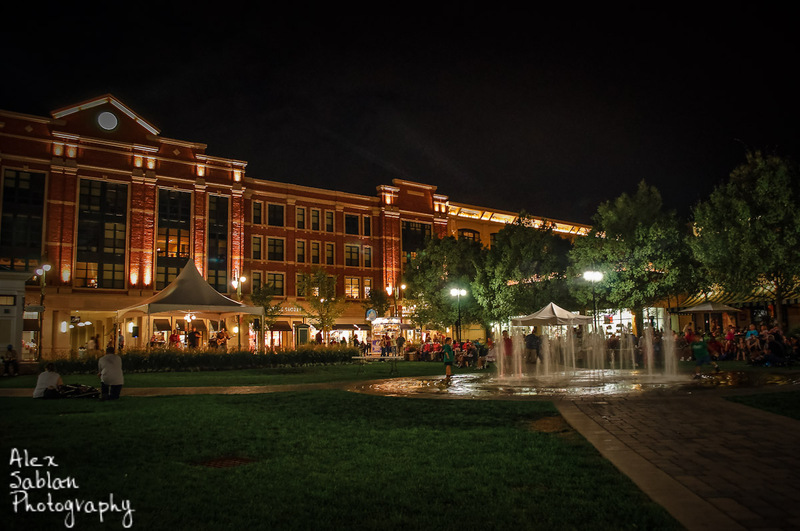 The Greene Towne Center is a walking mall located outside of Dayton, Ohio in a suburb called Beavercreek. The mall has a park area around a splash fountain for the kids. 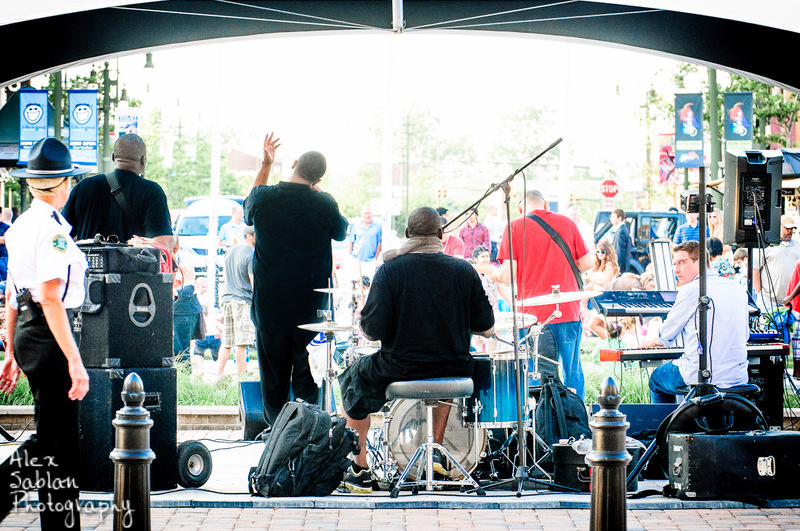 Thursday, Friday, and Saturday evenings, The Greene provides music by local groups. This past weekend the music was provided by Funky G and The Groove Machine. Funky G entertains the crowd with music spanning the seventies to the present. Ranging from Earth, Wind, and Fire to Usher, the music Funky G performs appeals to a large demographic. 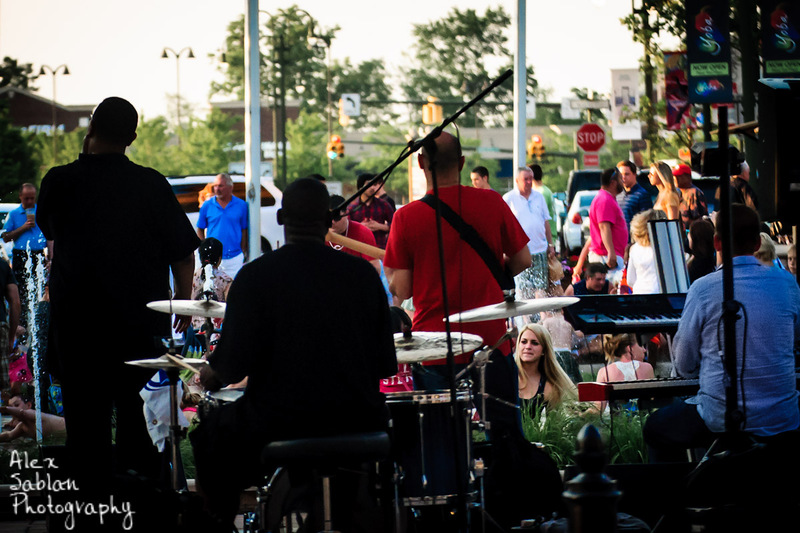 The band performs regularly in Cincinnati, Dayton, and Columbus at events from weddings to large corporate events to Reds games. For booking information, go to their contact page and contact Kelli Kooken.